The academy’s annual Color Parade, honoring the fall and spring color companies was held on Worden Field, this morning, at 11 a.m. Mr. Roger M. Natsuhara, Assistant Secretary of the Navy – Energy, Installations & Environment, Naval Academy Superintendent Vice Adm. Michael H. Miller; and Commandant of Midshipmen Capt. Robert E. Clark, II reviewed the parade. 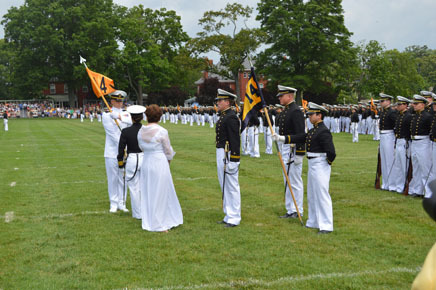 The midshipmen of 20th Company have earned the honor of being designated as the spring 2013 color company through their accomplishments during the last semester. One newer tradition at the USNA is the “Another Link In The Chain” program. This program, developed by the USNA Alumni Association, creates a bind between the current class and the one that graduated 50 years prior. Their class ring will have some element from the Class of 1963 into the design to cement the bond between the two. This year’s class is “linked” with the Class of 1963 and there were rings from ’63 that were donated and the gold was used to create the ones for ’13.. In addition to members of the Class of ’63, there was a special guest– the Color Girl (now called Color Honoree) from 1963, Diane Melton (nee Lovewell) from Arlington, VA.
Midshipman 1st Class Brooke Pitcher, of East Hampton, Conn., served as the spring semester color company commander. At graduation, she will be commissioned as an ensign and will train as a Navy pilot. Pitcher will receive the Stewart Wight Hannah Memorial Trophy. The silver bowl will be displayed in Bancroft Hall throughout the year and is inscribed with the spring semester color company number and the name of the new Color Company commander. A color honoree is selected by the winning spring semester company commander. Pitcher has selected her mother, Kelly Fabrycki Pitcher of Hartford, Conn., as the 2013 color honoree. Midshipman 1st Class Chloe J. Staab, of the 14th Company, from Chino Hills, Calif. served as the fall semester color company commander. At graduation, she’ll be commissioned as a Navy ensign and will serve as a surface warfare officer aboard the U.S.S. New Orleans. 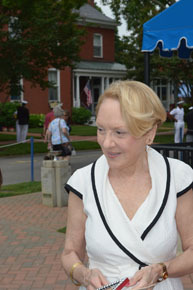 Staab will receive the Forrestal Award, an engraved silver tray presented in honor of the nation’s first Secretary of Defense, James V. Forrestal, donated by the late Charles P. McCormick. For more information about May events at the Naval Academy, visit www.usna.edu/CommissioningWeek/. For more information about the Naval Academy please visit www.usna.edu or our Facebook page. To view our full gallery of images and video from the Color Parade, please go here!